Do आप like yoeman Rand? Which Voyager Woman is your favourite? Of all the women from the तारा, स्टार trek universe, which one do आप relate to the most? Guys please help.If आप have a good idea of a new spot banner with alla तारा, स्टार trek women ( i mean तारा, स्टार trek tos,voyager,ent e.t.c) please let me know and अपलोड it on the spot. France Nuyen played "Elaan" on "Star Trek - The Original Series", episode entitled "Elaan of Troyius". 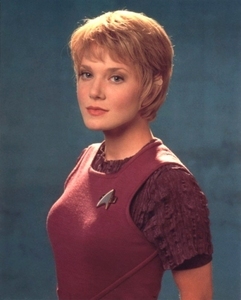 a comment was made to the poll: Which Voyager Woman is your favourite? How many episodes of "Voyager" did Kes appear in?